The three women - coiffed, well-dressed, affable - were born within a few years of one another in the same area of what had been Austria-Hungary. Two were probably delivered by the same midwife, as was one of their husbands. As children, they learned to swim in the same river by holding the tails of cows to stay afloat. Together, they eagerly awaited the end of the Sabbath so they could rush to the theater to watch dubbed Shirley Temple movies. From there, the similarities darken. In 1944, when they were teens, the Nazis rounded up the three girls and others from their town in cattle cars. The girls were sent to Cellblock C in Auschwitz, and then on to a smaller camp, Reichenbach, where they worked seven days a week in 12-hour shifts. The nightmare ended for them when the Russians came to liberate the camp. After the war, the three passed through displaced persons camps, and alighted briefly in their hometown of Munkacs (pronounced MOON-kawtsh) before moving, some to Israel, and then all of them to America, never to see each other again. Until, that is, last month. 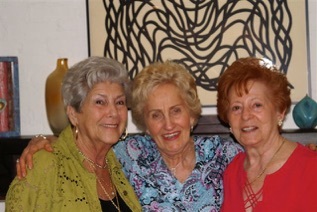 A lifetime later, after a series of nearly unbelievable coincidences, the three women - Rachel Ickovics of Richboro, Pa., Lilly Segelstein of Overland Park, Kan., and Viola Ohlbaum of Delray Beach, Fla. - were again together, this time to talk, laugh, reminisce, cry, and explore the powerful bond of motherhood and family. What are the chances? they asked one another. The older women survived Hitler, built new lives in the States, and found one another through their daughters - a bookseller, a musician and a scientist - in the small shore town of Madison. But then, consider this: If a confluence of awful events can deliver a horrible shared history spent trembling through the Holocaust, shouldn't the world also offer happy coincidences that create something good and beautiful? Like a joyful reunion? Before the war, their town of Munkacs had a thriving Jewish community. A town crier delivered the news. On the Sabbath, the streets closed. When the Germans came in 1944, residents were herded into ghettos, and then into forced labor camps. Many died along the way. Many more died in the camps. Within five minutes in front of the Gestapo on one awful April day, Rachel Ickovics' parents disappeared, gone forever. One guard pointed to a chimney and said, "You see the smoke? Your parents are dead already." Another time, the Gestapo announced that every 10th person in line would be shot. Rachel Ickovics was No. 30, but she ducked, and survived. Viola Ohlbaum says she once wanted to throw herself on an electric fence in Auschwitz, but a cousin stepped in and stopped her. "There were people every day who threw themselves on the fence," Lilly Segelstein says now, quietly. Those stories, when they were told at all, came much later, after the three settled in the States. In the meantime, they found synagogues, married other survivors, lived their lives with these survivors. They learned English, became parents. They became bakers, tailors, seamstresses. They owned small businesses - hair salons, home goods and the like. To their daughters - Jeannette Ickovics, Roxanne Coady, and Cookie (a nickname from birth) Segelstein - the Holocaust was a black hole. The parents kept silent, to shield their children from the horror. It was not in the school curriculum, nor even discussed much in Hebrew school. But the truth will out. Poised on their own adolescences - the same years stolen from their parents - the daughters, independently and time zones away from one another, began asking questions about the past. In the Hartford area, the impetus for Ohlbaum's daughter, Coady, was reading Leon Uris' "Exodus," a best-selling novel about the founding of Israel. Coady was 11, about the time her father, Emerich Ohlbaum, of Em's Bakery stores, asked her to work the company books. Ohlbaum, who died last year, knew education was important, but he also knew the value of hard work. Coady became a national tax director at a New York accounting firm, appearing once on the cover of Money magazine as "the accountant's accountant." She and her husband had a weekend home in Branford, and she nurtured a dream of selling books. In 1990, she opened an independent bookstore in Madison, R.J. Julia Booksellers, now wildly popular. It is named partly for her grandmother, who died in the Holocaust. As a teenager in Kansas City, Mo., Cookie Segelstein watched the 1955 documentary "Night and Fog" at her synagogue and only then did it dawn on her that the harrowing story involved her parents. Still, she didn't delve too deeply. Segelstein's father, Boris (Dov) Segelstein, a tailor who died in 2000, had a decidedly dour view of the world, she said. In second grade, Segelstein was asked to bring in a family motto. Hers was a favorite saying from her father: "Mankind is an ugly beast, a cruel hoax God played on the Earth." When the school called home, her father told them, "It's true and I want her to know that." Cookie Segelstein trained to be a classical musician at Yale University. Now, she travels the world playing klezmer, the music of her ancestors. "I was trying to re-examine what had been in my back pocket all the time," she said. 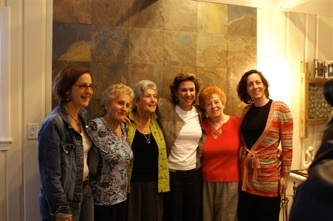 The Ickovicses, who had moved to the Philadelphia area, made friends mostly with other survivors. A postdoctoral fellowship brought Jeannette Ickovics to Yale University in 1989. She now is a Yale professor of public health and director of the school's Community Alliance for Research and Engagement. "I am in public health, so my work has always been about making a difference, particularly to the women and the children I work with," she said. "In the last few years, my own family history has deepened my personal sense of responsibility. It has strengthened my sense of individual responsibility, in the context that we can't look away from social ills and pretend they will go away. Because they don't." Over the years, the daughters and their siblings say their questions grew more important. Another generation - their own children - was born into a culture that demanded the Holocaust, the Shoah, be remembered. The black hole could not be ignored, and each of the daughters found herself circling back. Cookie Segelstein and Jeannette Ickovics first met in 1996 at a Deep River synagogue; they remember the details differently. Segelstein says Ickovics overheard her speaking English in a Hungarian accent and, curious, struck up a conversation. "Don't speak that way in front of the children." Either way, as the women excitedly began talking, they discovered that the details of their families' lives dovetailed in countless ways.They wrote a script, a 20-minute duet, to read at a Holocaust memorial service, where they spoke as their parents. And then, in 2001, Segelstein, whose bands include Veretski Pass and Budowitz, went to Coady's son's school and performed. As she often does, she talked about her family. The boy, Edward, told her afterward that his grandparents were Hungarian survivors, too, and Segelstein filed that away. Maybe two years ago, she saw Coady - something of a celebrity in the area because of her bookstore - at a Branford shop, and they began talking about their shared history. Meanwhile, Ickovics and her husband and their two sons had moved to Madison. Earlier, Segelstein told her that Coady, too, shared their geographical roots. Excited, Ickovics went to Coady at her bookstore around Passover of this year, and mentioned their shared heritage. Barry Ickovics, the only surviving father of the three daughters, accompanied his wife to the reunion. As he and Viola Ohlbaum began to talk, they discovered that they grew up within two doors of one another. "Do you remember?" he said. "Do you remember?" she said. They turned to one another, excited, and together recalled a neighboring red-headed woman named Drezl, Drezl's hefty aunt, childhood nicknames, the river. The conversation leapt from English to Hungarian and back again, with Rachel Ickovics' reminders that not everyone in the room - there were about 20, including siblings and grandchildren - spoke Hungarian. While the parents talked, their daughters watched, enraptured, hands over their mouths. A videographer recorded the event. A free-lance writer took notes for a possible book. As they've gotten to know one another, the daughters have discovered that they are all optimists, that they are hard workers and that they are persistent about reaching goals. They wonder how much of their makeup is genetics, and how much can be attributed to their parents' traumatic youths? "All of us look at our mothers, and think `Could we have survived this?'" Cookie Segelstein said. 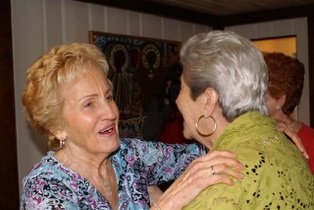 "After 62 years, to meet like this," Ohlbaum said. "I think it's like a miracle." As the shadows lengthened outside, no one showed signs of leaving. The videographer suggested that the survivors sing a song. They looked at one another hesitantly, and then settled on a childhood song - in Hungarian - about how a pretty person is the person you look at most. They laughed and clapped and then sang two more tunes, one about skipping off to school, and another about infidelity. They stood for multiple photos. They talked about meeting again. The day wove its way toward an impromptu concert by Cookie Segelstein and band-mate Peter Harrow. While the others waited for the traditional music to begin, Jeannette Ickovics asked the parents what they wanted their families to remember from their experiences. Very quickly, and smiling shyly, they said in order: Faith. Love. Kindness. Family.